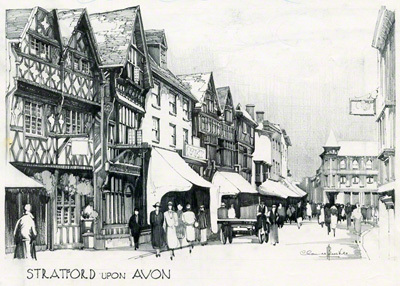 A pencil drawing of Stratford-upon-Avon by Claude Buckle. The picture shows the Garrick inn. 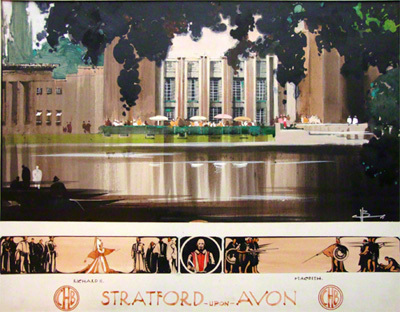 Claude Buckle captures the same scene as his famous poster of Stratford-upon-Avon. This pencil drawing shows the Garrick Inn in the High Street of Stratford. The Garrick Inn is a timber framed building dating back to the 1400's. It has a rich history including plagues, fatal fires and priest hole. Stratford-upon-Avon famous for being the birth place of Shakespeare developed along the banks of the River Avon and was the subject of another Claude Buckle painting. (see below) Created in 1935. Stratford-upon-Avon the birth place of Shakespeare.